Animals' reaction to earthquakes has often been suggested as a useful guide to detection or a source for future sensory equipment. Snakes are the most quoted species for predicting a quake, presumably because they are closer to the information. We recently reported on wood ants that conveniently chose small fault lines as warm places to live! The use of pandas in their native China would seem to be dead wood, however, a quake that measured magnitude 6.6, near the Bifengxia Base of China Conservation and Research Centre in Ya-an recently (on Saturday, 20th April 2013), saw the reaction of the pandas in the reserve. When they sensed the earth moving, the 60 animals simply panicked and climbed the nearest trees. Only 50km away 188 people died and 11,000 were injured according to first reports. No pandas were injured but the precarious perch of the highest climber was a swaying 20 metre pine. Ren Yao was the spokeswoman, stating, "no pandas or people were injured," but they were, "slack jawed," with shock after the quake struck, China's official news-agency Xinhua reported. The research centre was slightly damaged. After the tremors and 2000 aftershocks, the pandas are now scoffing apples and being comforted by staff members who call their names when new shocks might cause them distress. 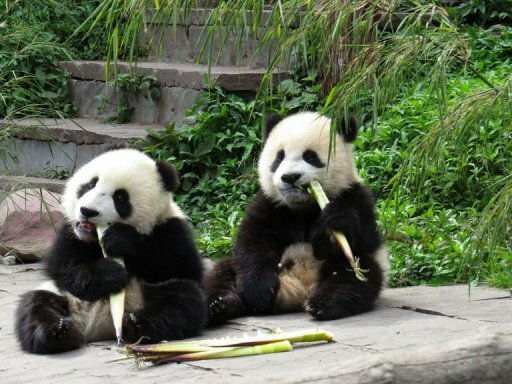 Szechuan province is home to 1600 wild pandas, who may have had no consolations like the apples their con-specifics had! Earthquakes are frequent there, including the awful 2008 quake which killed 90,000 people and a panda or two. With pandas, as Edinburgh Zoo can guarantee, the reproductive rate is very low and habitat loss includes another huge swathe of bamboo forest after the 2008 earthquake. People seem cooperative throughout Shaanxi, Gansu and Szechuan Provinces, but their land use is changing and overtaking the shy wild pandas. Let's hope the 1600 don't have too many more shocks and can organise into two groups of 800 breeding pairs!